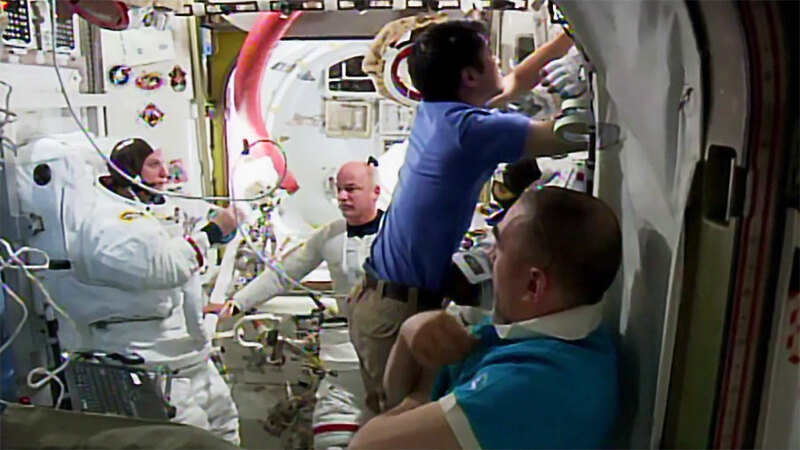 A pair of astronauts tried on U.S. spacesuits this morning ahead of a spacewalk next week. Afterward, the crew explored heart cells, fluid pressure in the head and the eyes and the composition of meteors. NASA astronauts Jeff Williams and Kate Rubins are due to work outside the International Space Station on Aug. 19 for 6.5 hours. The duo tried on the spacesuits today they will wear during the spacewalk to complete the installation of the first of two International Docking Adapters to the Harmony module. Commercial Crew vehicles are being developed by Boeing and SpaceX that will dock to the new adapters in the future. Rubins then moved on to observing heart cells with a specialized microscope. The heart cells are derived from stem cells that were manufactured from human skin cells. Williams joined cosmonaut Anatoly Ivanishin for ultrasound scans and vision checks. That work was part of the Fluid Shifts study that is exploring how the lack of gravity influences head pressure and eye shape possibly affecting an astronaut’s vision. Japanese astronaut Takuya Onishi replaced a hard drive on a laptop computer that collects data on the composition of meteors entering Earth’s atmosphere. Cosmonauts Oleg Skripochka and Alexey Ovchinin participated in a study that seeks to improve the ability of a crew member to pilot a spacecraft.